Mirror mirror on the wall…which bar has the most amount of alcohol brand mirrors of them all? Well after a recent trip to Arthur’s Tavern, I can honestly say that they have the most mirrors on the wall (but honestly who is counting?). 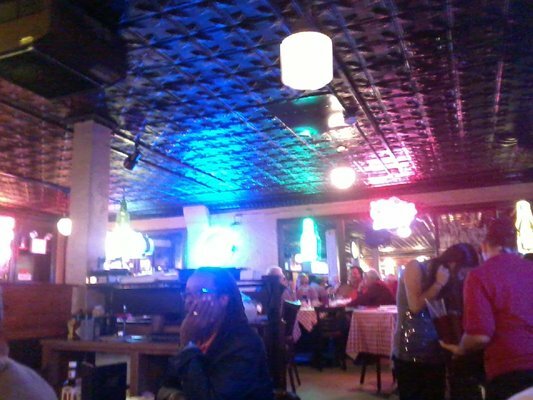 I went to Arthur’s Tavern, located at the corner of 3rd Street and Washington Street, for a professional work dinner/seminar on Thursday night. The event started at 4 PM so the bar wasn’t really packed except for like minded people in my profession. 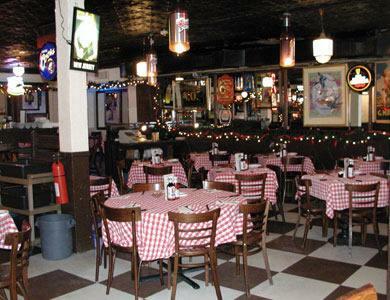 When walking into Arthur’s you are drawn to 2 things…the red and white checkerboard tablecloths and the tons and tons of alcohol merchandise on the walls. I don’t know if they actually purchase some of this stuff from other bars, or they have just been around for so long and carry so much alcohol that they have amassed all of the merchandise on their own. They have so much memorabilia it would make every fraternity house jealous. I am talking those mirrors with beer and alcohol brands on them…from Schlitz to Lowenbrau, from Amaretto to Red Wine, just covering the walls. They were basically stacked one on top of another edge to edge. Along with the mirrors they have tons of neon beer lights as well. Arthur’s Tavern has such a comfortable old neighborhood feel. With their red and white tablecloths and wood tables it’s sort of like the Peter Luger’s on Hoboken (though while their steaks are larger and tasty…they aren’t on the same level as Luger’s). Also adding to the motif is the unmatched hanging lamps over the tables, white and dark wood walls, and large checkerboard floors. As I said I was attending a work function at Arthur’s, so after our seminar we headed upstairs to our own private bar and dining rooms. It was then that I realized just how large this place is- just massive room after massive room. You can honestly bring party of 20 and they probably can have space for you. Because we had a private bar, the selection of tap beers was only Yuengling, Coors, Sam Adams and maybe one other. I am sure at their bigger bar they have plenty more to choose from. Also apparently they have monster-sized mugs of beer for only $7, but being that some of the night was open bar, and the rest of the time I felt that I should have some control over myself when around co-workers, I took a pass on them. After a couple ofbeers, an hour or so of “Professional Development” it was time to go home and watch my Cardinals. 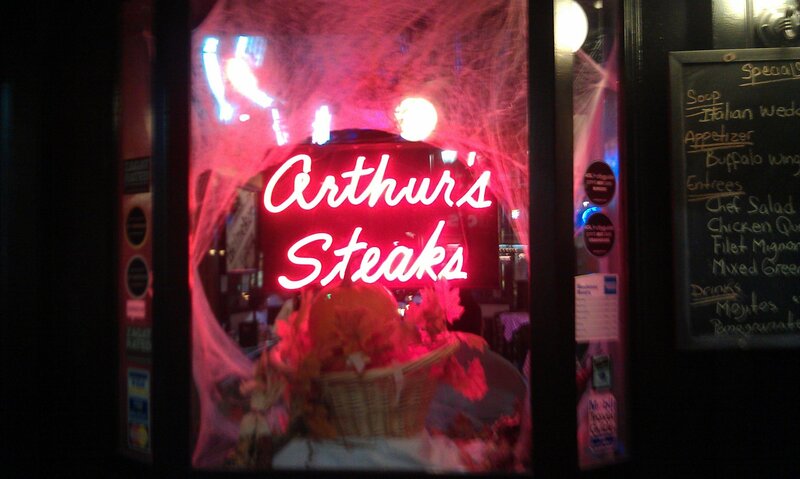 Preconceived notion – I’ve never been to Arthur’s before but being that it is a steakhouse I thought it was going to be slightly fancy. Obviously I was wrong about that…it was a steakhouse meets a neighborhood bar, with authentic flair on the walls. 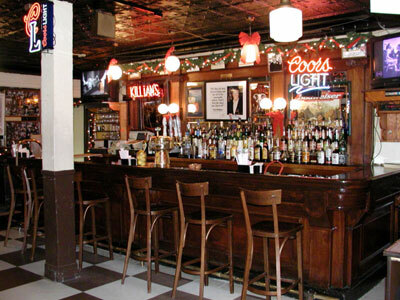 Crowd stereotype – Tough to say because I didn’t spend time at the public bar. Music – Didn’t hear any where I was. Value – Very good value for both food and beer. $7 for huge mugs and the steak…while not comparable to the finest NYC steakhouses you can get a huge 24 oz steak for a very reasonable price. Date – Would be a decent place for a date for a nice casual dinner. But bring your appetites. Overall - This place surprised me with how welcoming it is, and how large it is. It probably is the biggest restaurant on Washington Street. And because of that size I understand why there were rumors of this place being sold to another Hoboken restaurateur because with this size the possibilities are endless. That said this bar/restaurant definitely brings out the old school Italian meets fraternity house appeal. Unfortunately I didn’t have a chance to hang out at the normal bar nor get a chance to try their famous burgers, but I am definitely looking forward to heading back sometime. 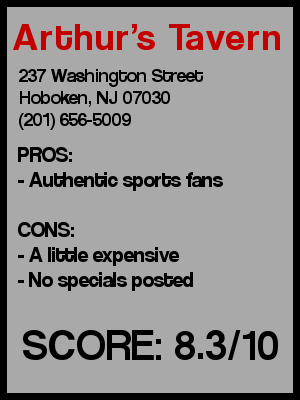 Overall I give this place an 8.3.